Initially the intention of this article was to highlighting how much plastic ends up in landfill or worst still, strewn on land and in the ocean due to the amount of supermarket packaging not being recyclable. I wanted to drive home the need for us all to be more aware of product packaging when it comes to buying goods and discarding the materials they come packaged in. It is not enough to give you tips, facts, figure and stats – you have heard it all before. There are so many statistics banded about that people become immune, they close off, they think that they are doing everything they can to help. "Unfortunately, a small and thoughtless action in our daily life can cause huge damage to nature without us even realizing it. In this campaign, we aim to remedy this by reaching the largest number of people possible, bringing awareness to the fact that with small and easy steps, we can ensure that terrible scenes like these do not happen,” Guiga Giacomo, Executive Creative Director at Tribal Worldwide São Paulo. Is this enough to make you sit up and consider that there might be more you could do? Consumers can make a valiant effort to reuse and recycle but if the changes are not made at the top of the chain, the problem is always going to exist. As a wife and a mum, in my household we make a conscious effort to reuse and recycle where we can. Thing is, a lot of the packaging from supermarkets, particularly own brand food packaging, ends up in landfill as the materials are not yet recyclable. As a company, our ESOL bottles are made from recycled plastic and are recyclable; our packaging is done using recyclable boxes and reusing shredded paper instead of bubble wrap. It is important to us to know that we are having as little impact on the environment as possible. Do you diligently check the labels of everything before you choose which bin it should go in? 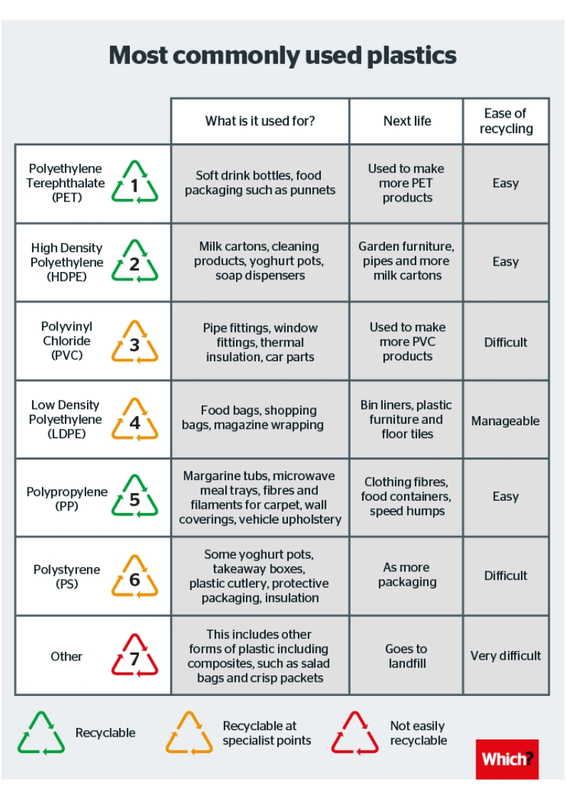 A large number of people assume that most plastics can be put in the plastic recycle bin; look closer, this may not be the case. Ask yourself this, what makes up the majority of the contents of your landfill bin? I would bet that the vast majority of it is non-recyclable plastic? With 525,000 tonnes of plastic being used by households each year, 169,145 tonnes is recycled leaving 355,855 tonnes ending up in landfill or being incinerated. 355.855 tonnes of landfill plastic is the equivalent weight of 294,095 Mini Coopers! What effects does landfill plastic have on the environment? When plastic is dumped in a landfill site it starts to interact with the surroundings. When it comes into contact with water it can form dangerous chemicals which ultimately seep into the ground. Plastic is a man-made material made with toxic chemicals; over time these chemicals are released, polluting the air we breathe. The wind can lift and carry plastics from landfill into the surrounding areas and beyond. This causes unsightly littering and also potentially threatens the safety of wildlife. With plastic production amassing to 381 million tonnes, the logical solution would be for supermarkets to make sure that all their packaging was recyclable, right? 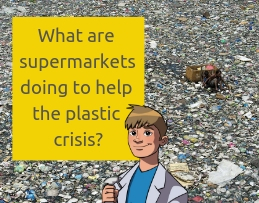 What are supermarkets doing to tackle the plastic crisis? How are supermarkets reducing single use plastic carrier bags? One of the first major changes to reduce plastic pollution was the introduction of the plastic bag charge legislation in 2015. In Scotland, Ireland and Wales all shops are required to charge a minimum of 5p for single use plastic bags, with a charge of 10p for re-usable bags. In England, only larger retailers (with more than 250 employees) were required to charge customers 5p for a single use carrier bag. Smaller retailer could volunteer to join in however charging for bags were not compulsory. In 2018 it was announced that the charge applicable in England was forecast to double, raising the minimum charge to 10p. This charge is not a tax and does not go to the government, retailers are expected to give these proceeds to good causes but ultimately it is up to them what they do with the money. 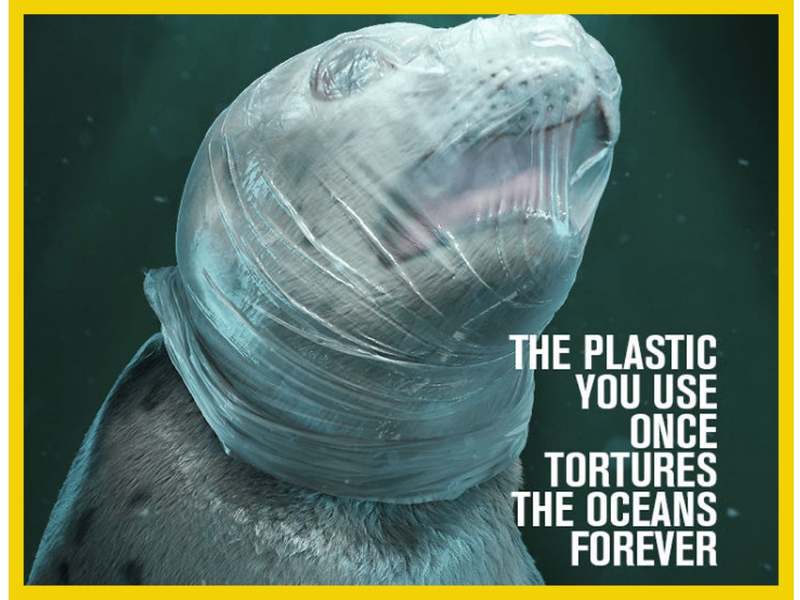 Knowing this, will you remember to take your reusable shopping bags with you the next time you visit a shop? What are supermarkets doing to reduce plastic in their own label goods? 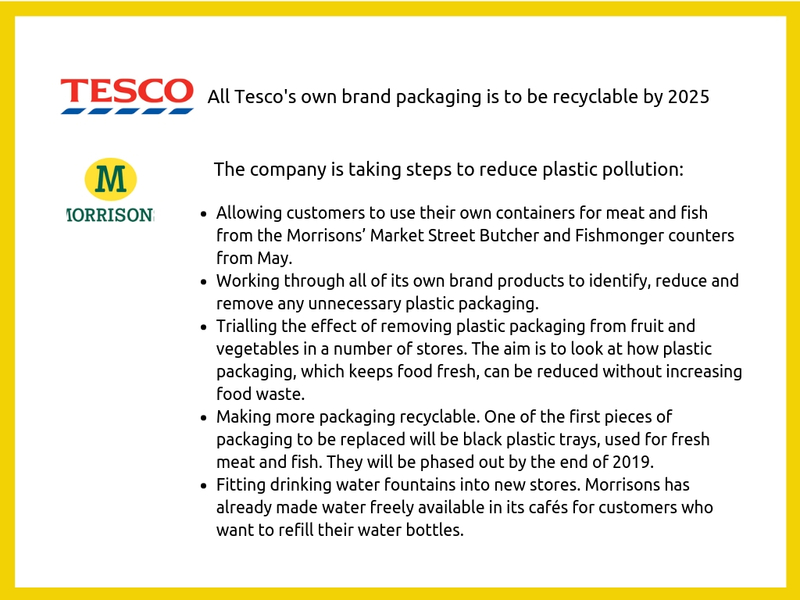 A number of supermarkets and other companies have joined the ‘UK plastics pact’ set up by the WRAP organisation. WRAP bring together businesses, government, communities and individuals to work towards a sustainable society. 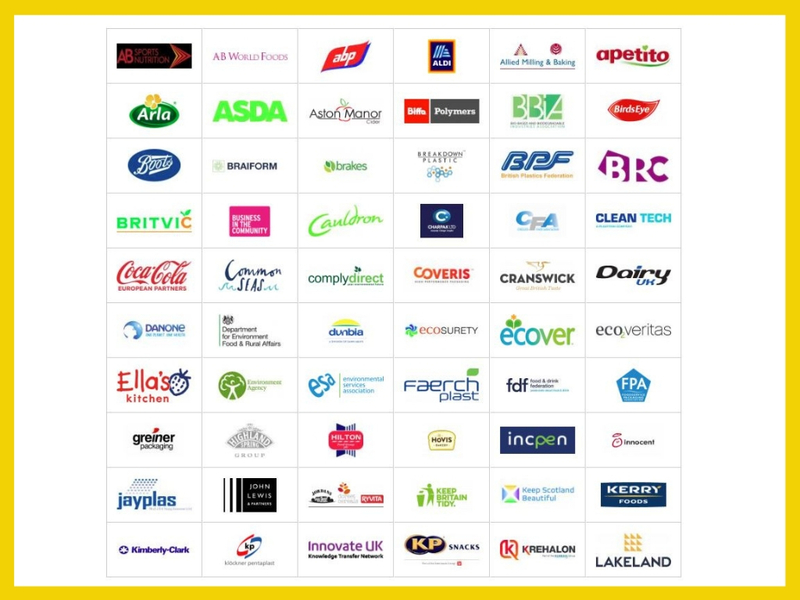 The UK plastic pact has members from across a large range of companies with the sole aim to change in the way we design, produce, use, re-use, dispose and reprocess plastics in the UK. How are the supermarkets educating their customers? 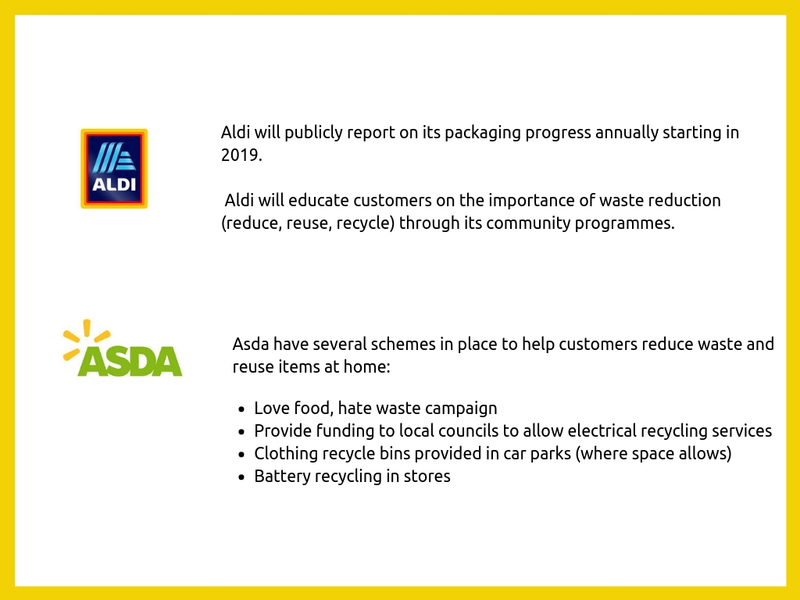 Customers not only need to know what the supermarkets are doing to reduce plastic waste but information is needed to allow customers to make the right choices and be aware of the facilities available to them. 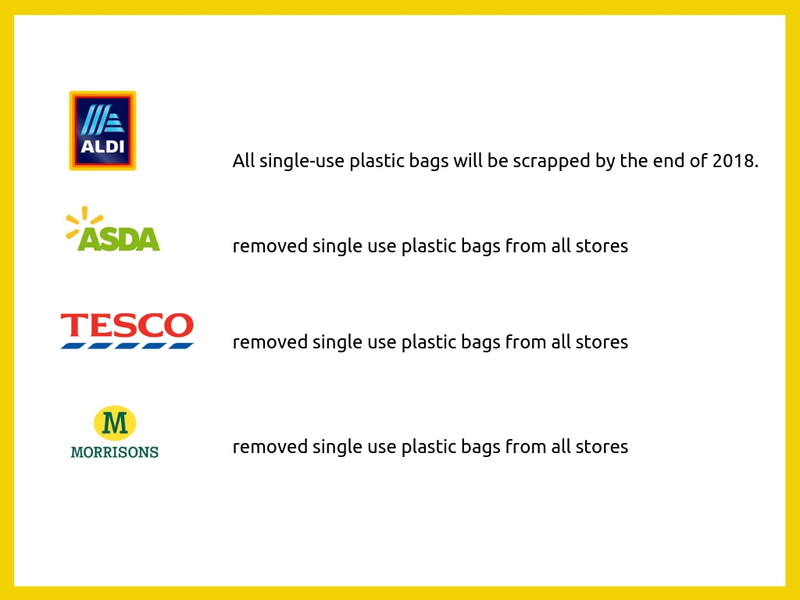 It is great to see these major supermarkets eradicating single use plastic bags completely, because as long as they are available, people will buy them and the cycle continues. 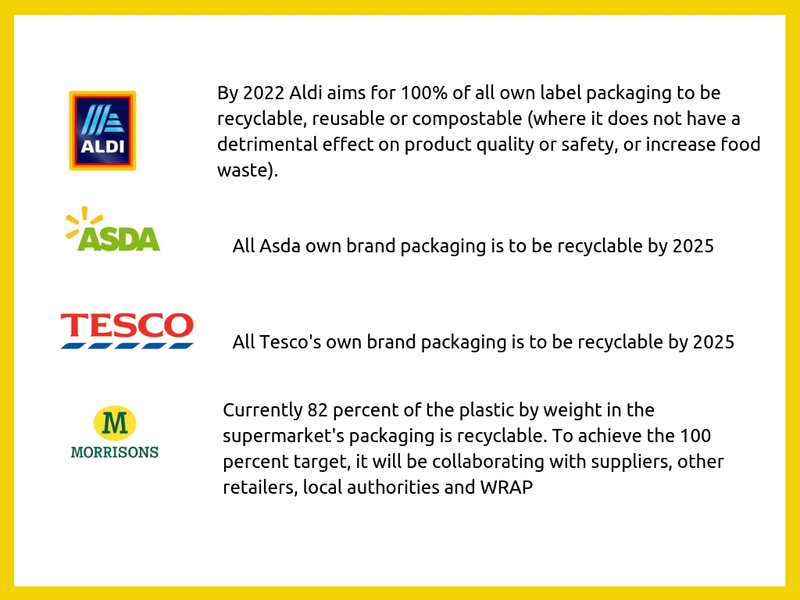 The conception of the UK plastic pact gives me confidence that supermarkets and companies are taking a stance on this issues and working together to make a difference. Consumers can try and do all they can to recycle and reuse but if manufacturers continue to produce single use / non-recyclable plastics, we are fighting a losing battle. When it comes to big brands, it is down to each individual company to make sure their products are packaged in recyclable containers, bottles and packaging. As individuals we need to be acutely aware of the products we buy and how we dispose of packaging. What happens if you do not recycle plastic? Making changes in the products we use, the food we eat and how we stay healthy and active can seem like a daunting task. Maybe you have you made some changes but don't know what else you can do? Our ‘Detoxify your life’ project could help you along the way; one email each month with helpful suggestions to detoxify your life one step at a time – interested?